It's my FIRST Royal Wednesday hop! :) If you are just stumbling onto my blog today, be sure to go back to the Queen Kat blog to start the hop. If you are here from Katarina's blog, you're in the right place. This week, we were given a sketch by Maria. I tweaked it a little to fit the limited stamps that I was able to borrow. I used the Hooters Stamp set, teehee, what a fun name! I colored with my markers, matted it on a scalloped circle, and paper pierced the edges of the scallop. The DP is from the Target $1 spot. And I finished with dew drops. Alright, now hop on over to the Queen Kat shop and pick yourself up some CA-UTE stamps that are on sale. Great first hop! Cute card! cute!! I love this card. Great card, love your interpretation of the sketch. Welcome, we are glad to have you. Great card. Welcome! Woohoooo! We are going to have a blast! Great job! Love the card! So thrilled to have you as part of the hop!!! I love that name too...Hooters!! Tongue-in-cheek yet appropriate!! Love the papers here!! These owls are too cute! I love your card! You're a busy lady, lady! This is so cute! Great job! great job! 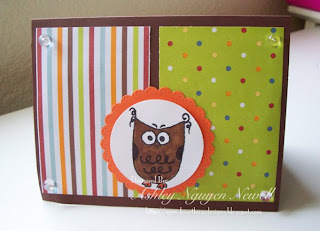 love how you used the owl stamp!